Yesterday we were at the beach at MacDill AFB in Tampa. Apparently the fish were numerous, because the Brown Pelicans, Forster’s Tern, Laughing Gulls, Ospreys and others were diving in. 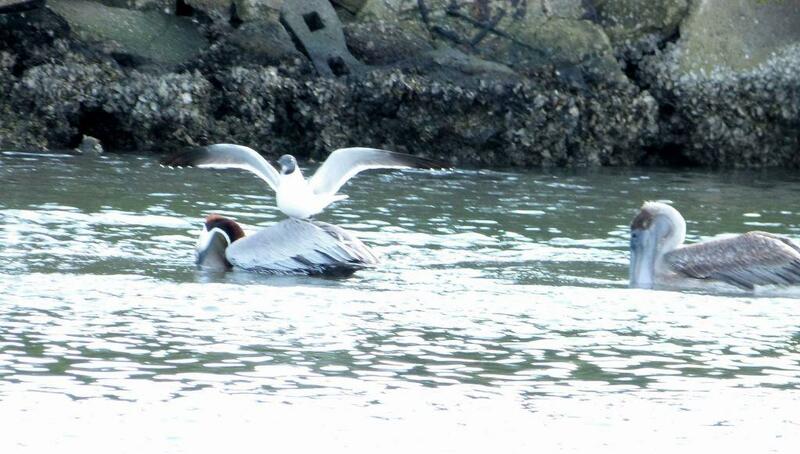 What really amazed me were the Laughing Gulls landing on the backs of the Brown Pelicans. 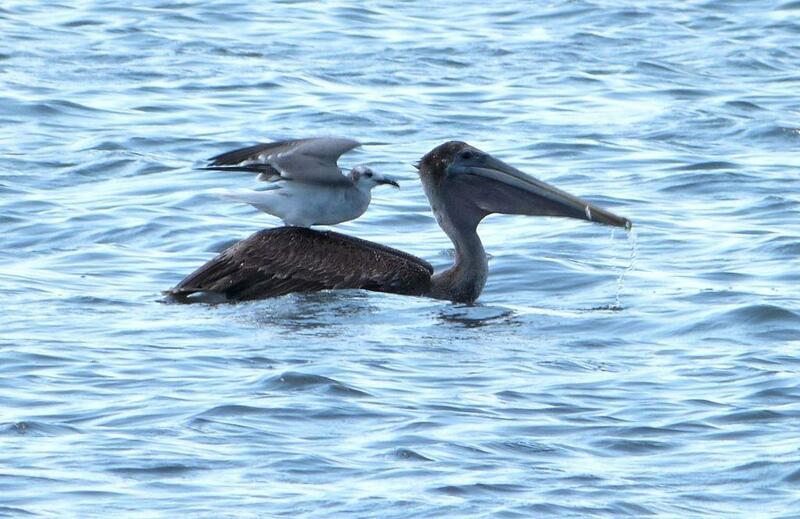 Checking the internet to find out about this, I came across this very interesting article, The Pelican and the Gull. 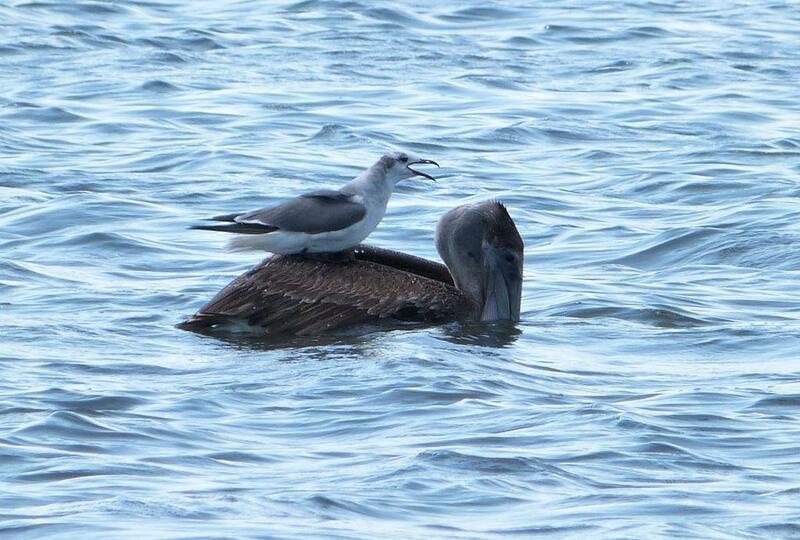 It appears this is a common practice for the Laughing Gull to steal some of the Pelicans food. 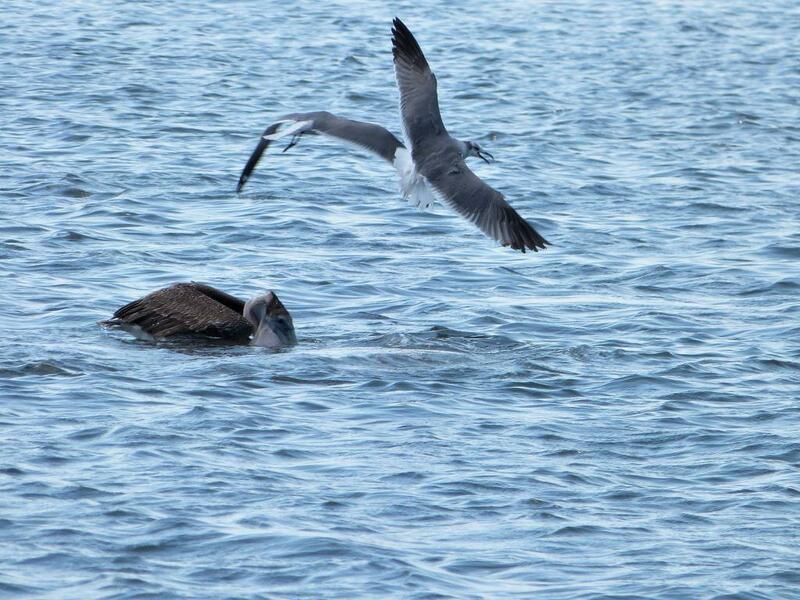 One method the laughing gull has of getting food is to steal fish from another seabird that inhabits the region, the brown pelican. 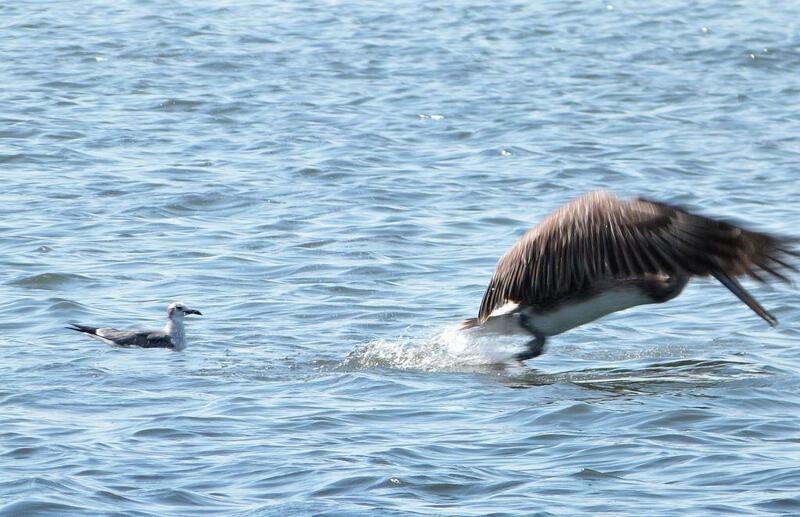 The laughing gull accomplishes this larceny by waiting for the brown pelican to make a successful dive…. 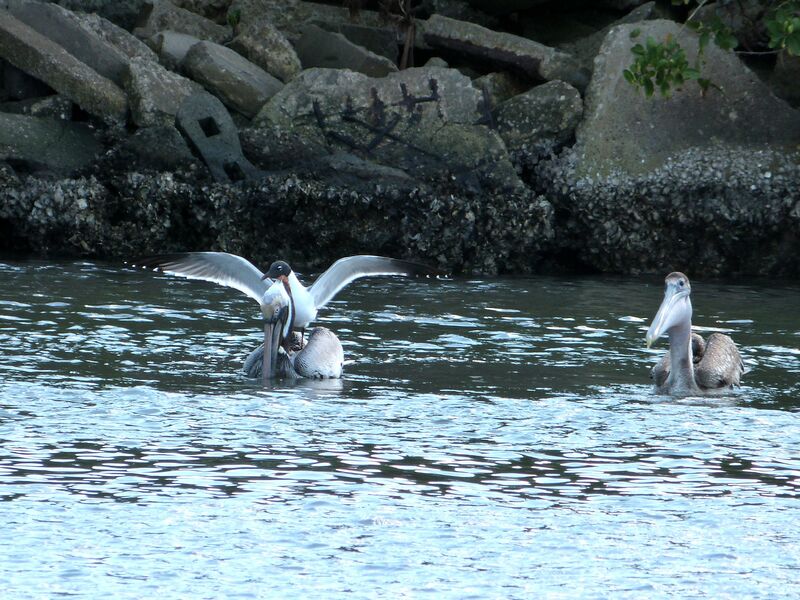 When the pelican has a bill full of fish and water, it transfers the fish to the pouch that hangs below its bill. The pelican cannot fly away or swallow the fish until the water is drained from the pouch. Laughing gulls either circle closely above the pelican or land on the pelican’s bill or head. 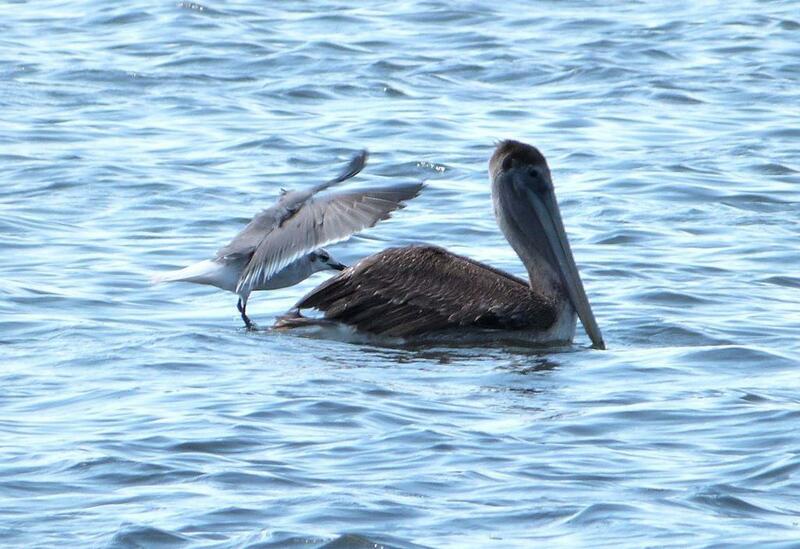 The gull may even give the pelican a sharp peck or two. 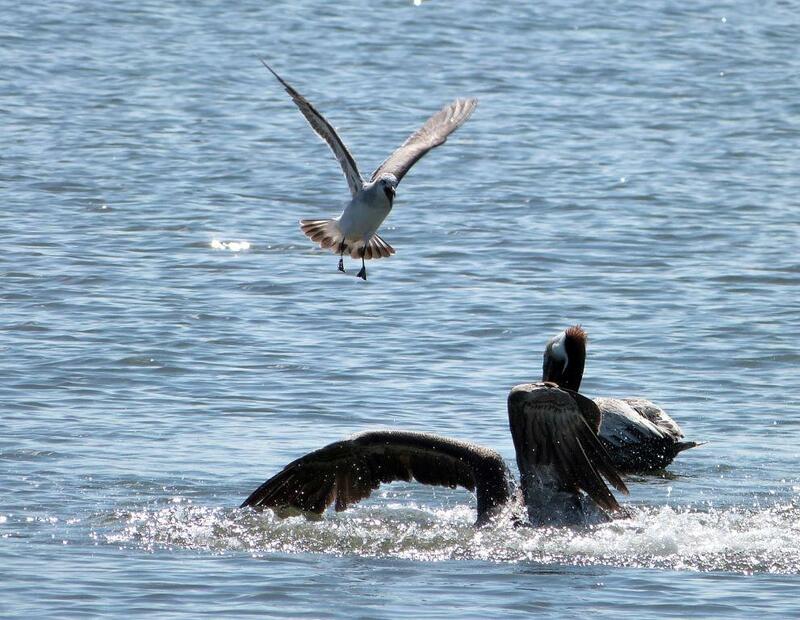 If the pelican pays too much attention to the antics of the laughing gull and not enough attention to the delicate draining and swallowing process, the pelican may lose some of the trapped fish. The gull then swoops down and scoops up the pelican’s hard-earned catch, flying away at top speed from the scene of the crime and makes short work of his ill-gotten gains. Of course, I could make all kinds of applications about not stealing, pecking someone on the head, or getting on their backs without permission. Because of the curse we are all under, the birds included, this kind of things happen. Eagles steal from Ospreys, Cuckoos lay eggs in other species nest, etc. For us, we know that stealing is wrong and I trust we don’t. Also, we are supposed to “love one another.” Not so sure this is being displayed here. These photos were taken with my zoom because they were out quite a way from the shore. The following two photos were closer up as they both posed on posts for us. Pelicans belong to the Pelecanidae – Pelicans Family and are on of the Birds of the Bible. The Brown Pelican is the smallest of the eight species of pelican, although it is a large bird in nearly every other regard. It is 42–54 in (106–137 cm) in length, weighs from 6.1 to 12 lb (2.75 to 5.5 kg) and has a wingspan from 6.0 to 8.2 ft (1.83 to 2.5 m). 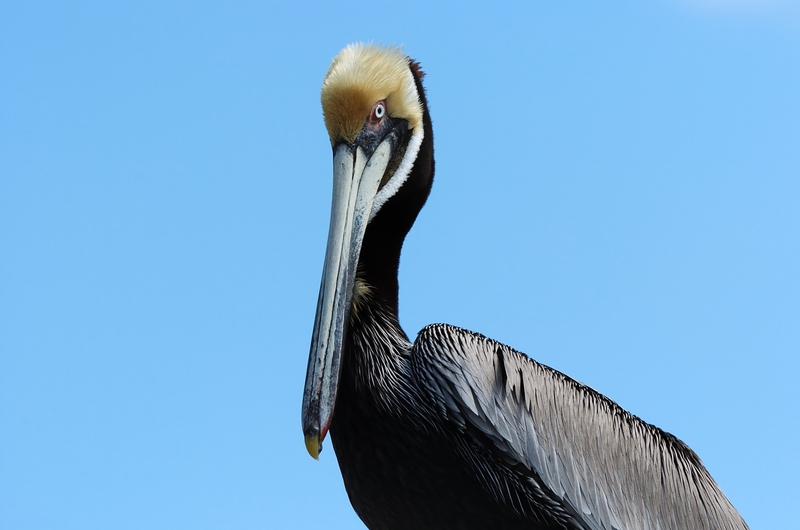 Through most of its range, the brown pelican is an unmistakable bird. 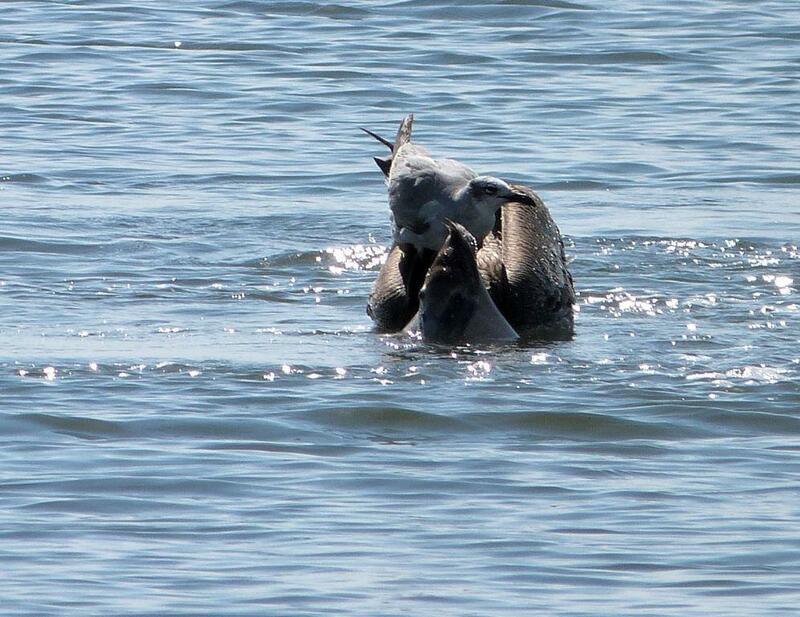 Like all pelicans, this species has a very large bill, 11 to 13.7 in (28 to 34.8 cm) long in this case, with a gular pouch on the bottom for draining water when it scoops out prey. The head is white but often gets a yellowish wash in adult birds. The bill is grayish overall in most birds, though breeding birds become reddish on the underside of the throat. The back, rump, and tail are streaked with gray and dark brown, sometimes with a rusty hue. In adult pelicans, the breast and belly are a blackish-brown and the legs and feet are black. The juvenile is similar but has a brownish-gray neck and white underparts. 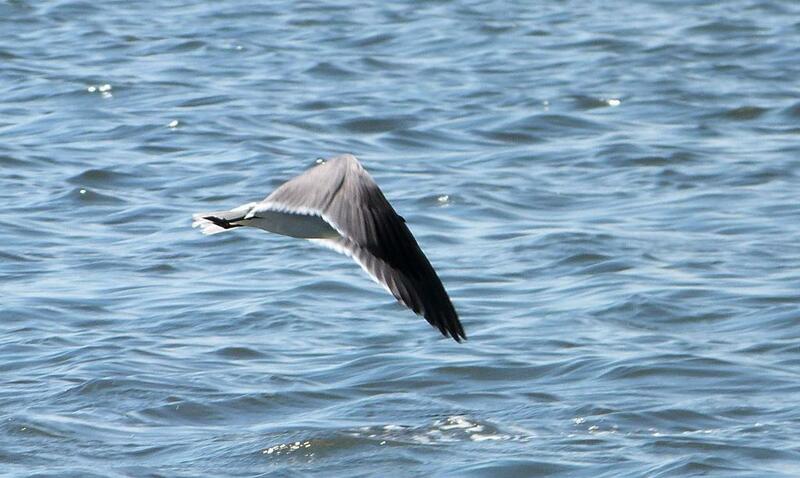 The Laughing Gull is a member of the Laridae – Gulls, Terns and Skimmers Family and is a Bird of the Bible also. 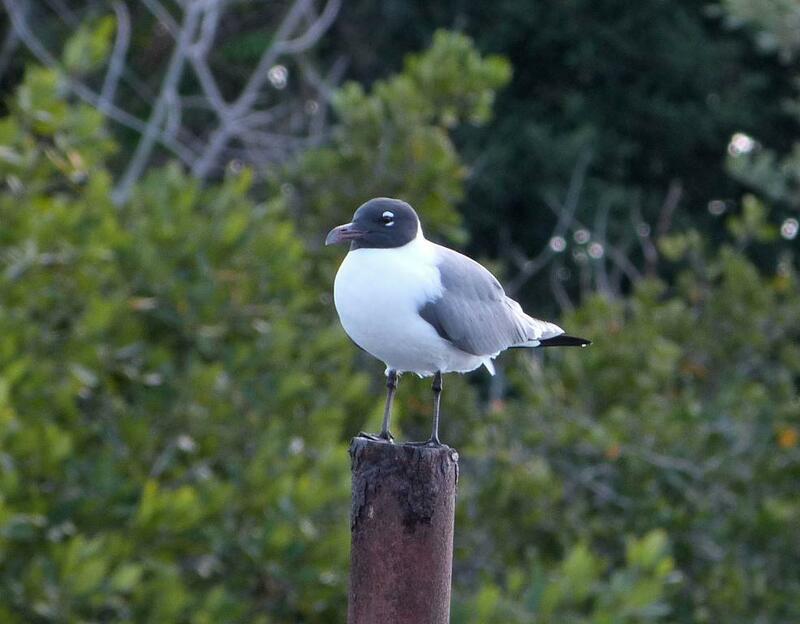 The Laughing Gull (Leucophaeus atricilla) is a medium-sized gull of North and South America. It breeds on the Atlantic coast of North America, the Caribbean, and northern South America. Northernmost populations migrate further south in winter, and this species occurs as a rare vagrant to western Europe. 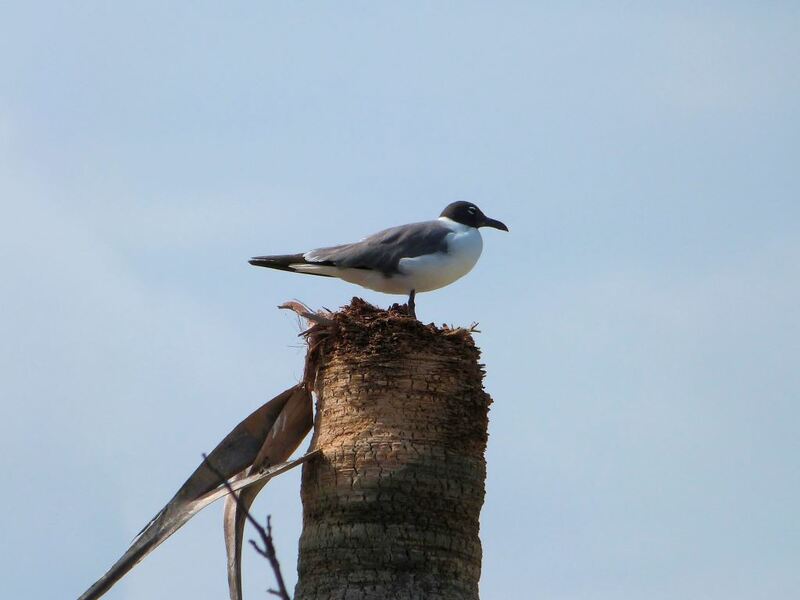 The Laughing Gull’s English name is derived from its raucous kee-agh call, which sounds like a high-pitched laugh “ha… ha… ha…”. This species is easy to identify. It is 14–16 in (36–41 cm) long with a 39–43 in (98–110 cm) wingspan. The summer adult’s body is white apart from the dark grey back and wings and black head. Its wings are much darker grey than all other gulls of similar size except the smaller Franklin’s Gull, and they have black tips without the white crescent shown by Franklin’s. The beak is long and red. The black hood is mostly lost in winter.